Similar to the previous post on running-related injuries, I had difficulty posting the tables as they are images added to the posting. Also, the tools provided below were created to be used by physiotherapists. They are a compilation of the risk factors discussed in the tables. The quantity and quality of the studies included in this review are not at the same level as those in the running article. It appears that there is a significantly greater amount of research on running-related injuries as compared to swimming-related injuries. This may be due a higher incidence of injuries in runners, however, I have not looked into the statistics. 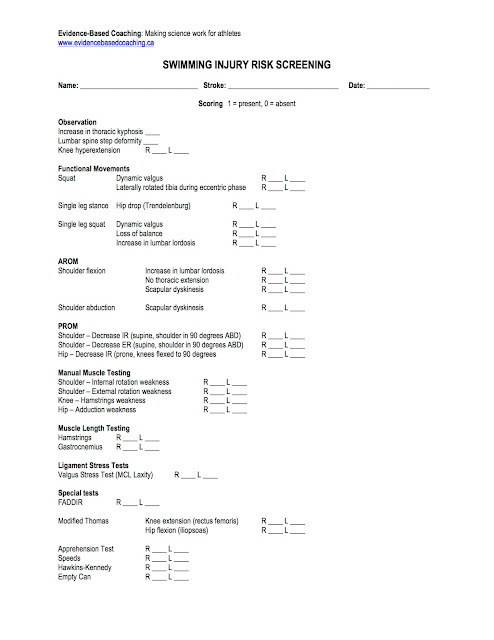 The injury risk screening is assessment that I created and used to assess swimmers in the national and provincial high-performance swim programs. There are a many ways to assess for the same risk factors. Please email me if you would like a link to the original article. Enjoy! There are a number of assessment screening tools that are used to assess the risk of developing an injury in competitive and recreational sports. The Functional Movement Screen (FMS) was one of the first tools created for this purpose. However, a recent systematic review with meta-analysis has shown that there is little correlation with FMS scores and injury risk (4). This may be due to the fact that the FMS was not created to assess sport specific risk factors. It was created as a general tool to assess common movement patterns. In order to develop a valid outcome measure that can be used to assess the risk of developing swimming-related injuries, it is necessary to determine which injuries have the highest prevalence and incidence in swimming. It is also beneficial to have a greater understanding of how certain characteristics, including stroke specialty, mechanism of injury, etc. are associated with the described swimming-related injuries. Once there is a clear understanding of the common swimming-related injuries, it is possible to determine the risk factors that are directly related to each injury. The appropriate variables/risk factors were collected and incorporated into a structured orthopaedic assessment tool. The tools provided below have not been assessed for validity or reliability. Additional research would be beneficial to determine the psychometric properties of the assessment tools. 1. Abgarov A, Fraser-Thomas J, Baker J. Understanding trends and risk factors of swimming-related injuries in varsity swimmers. Clin Kinesiol 2012;66:24-28. 2. de Almeida M, Hespanhol L, Lopes A. Prevalence of musculoskeletal pain among swimmers in an elite national trounament. Int J Sports Phys Ther 2015;10(7):1026-1034. 3. Chase K, Caine D, Goodwin B, Whitehead J, Romanick M. A prospective study of injury affecting competitive collegiate swimmers. Res Sports Med 2013;21:111-123. 4. 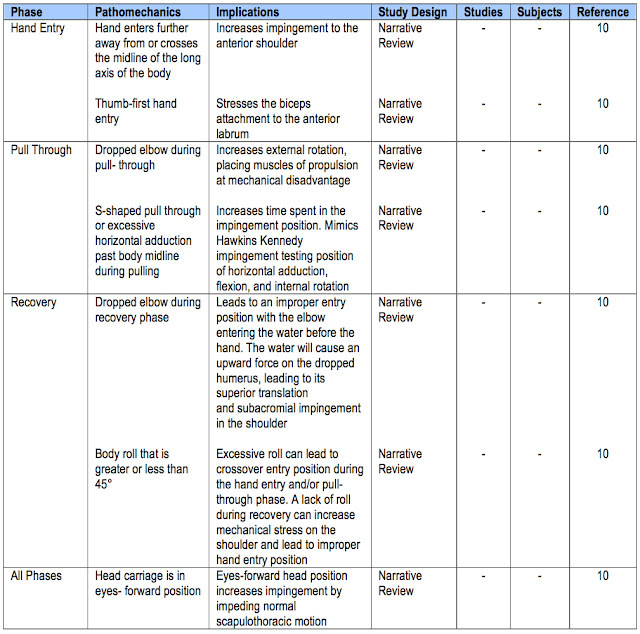 Gaunt T, Maffulli N. Southing suffering swimmers: a systematic review of epidemiology, diagnosis, treatment and rehabilitation of musculoskeletal injuries in competitive swimmers. Br Med Bull 2012;103:45-88. 5. 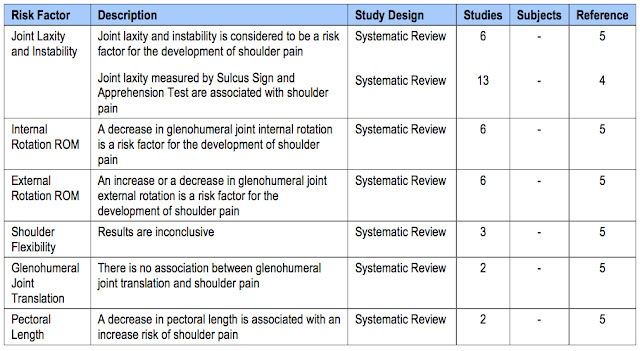 Hill L, Collins M, Posthumus M. Risk factors for shoulder pain and injury in swimmers: a critical systematic review. Phys Sportsmed 2015;43(4):412-420. 6. Kerr Z, Baugh C, Hibberd E, Snook E, Hayden R, Dompier T. Epidemiology of national collegiate athletic association men's and women's swimming and diving injuries from 2009/2010 to 2013/2014. Br J Sports Med 2015;49:465-471. 7. 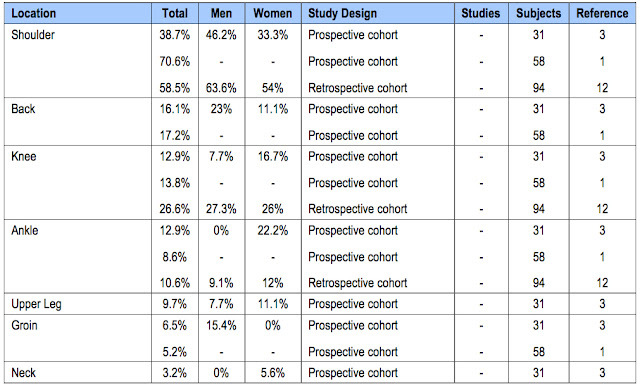 Moradi V, Memari A, ShayestehFar M, Kordi R. Low back pain in athletes is associated with general and sport specific risk factors: a comprehensive review of longitudinal studies. Rehabil Res Pract 2015;Epub:1-2. 8. Rovere G, Nichols A. Frequency, associated fators, and treatment of breaststroker�s knee in competitive swimmers. Am J Sports Med 1985;13(2):99-104. 9. Sein M, Walton J, Linklater J, Appleyard R, Krikbride B, Kuah D, Murrell G. Shoulder pain in elite swimmers: primarlily due to swim-volume-induced supraspinatus tendinopathy. Br J Sports Med 2010;44:105-113. 10. Virag B, Hibberd E, Oyama S, Padua D, Myers J. Prevalence of freestyle biomechanical errors in elite competitive swimmers. Sports Health 2014;6:218-224. 11. Vizsolyi P, Taunton J, Robertson G, Filsinger L, Shannon H, Whittingham D, Gleave M. Breaststroker's knee. An analysis of epidemiological and biomechanical factors. Am J Sports Med 1987;15(1):63-71. 12. Wolf B, Ebinger A, Lawler M, Britton C. Inury patterns in division I collegiate swimming. Am J Sports Med 2009;37:2037-2042. Evidence-Based Coaching: Making science work for athletes. This is one of the best materials I've found for my thesis for an ScD on "Overuse Injuries in Triathlon" , where I am using also a functional approach. Would you mind sharing the actual references for the full articles (this and the running risk factors?). Also I was wondering if you have something similar for cycling. From my research it seems there is a combination on ergonomic fitting and aids such as foot-shoe-pedal-interface orthotics for prevention of overuse injuries, do you have a similar article coming up with a risk factor page or cycling really depends more on good fitting and cardiovascular fitness versus all the biomechanical, postural factors? I completely forgot that I had posted this stuff on the website. Thank you for the kind words. Send me an email at michael@evidencebasedcoaching.ca. We can chat about your D.Sc. research. I may be able to help provide you with some additional info.